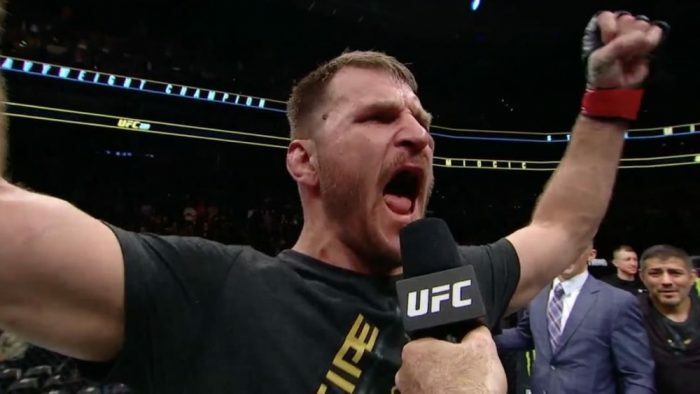 Stipe Miocic didn’t get a chance to speak inside the Octagon at UFC 226 but he’s making his demands known now. The longest reigning heavyweight champion in UFC history wants a rematch with Daniel Cormier and that’s the only fight he’s interested in taking. Add to that, Miocic had serious problems with how everything unfolded in the cage that night after he had just suffered a knockout loss and seconds later former champion and current WWE superstar Brock Lesnar was in the cage for a showdown with Cormier. “It was a s–t show and it was disrespectful. I didn’t think that was what the UFC was all about,” Miocic said when speaking to ESPN. As Miocic said, the UFC expects Lesnar to face Cormier for the heavyweight title once he’s eligible to compete again in early 2019. Lesnar is currently serving out the remainder of a one year suspension he received after testing positive for a banned substance surrounding his last fight at UFC 200 in 2016. Following the fight and his positive drug test, Lesnar ‘retired’ from the sport, which hit the pause button on his suspension until he was ready to fight again. Lesnar now has to serve out the remainder of that suspension and remain in the USADA drug testing pool before he can be cleared to fight again after Jan. 8, 2019. At that point, Lesnar is expected to face Cormier in a heavyweight title fight that will likely become one of the biggest selling pay-per-views for the UFC over the past couple of years. Miocic isn’t happy to hear that scenario unfolding, especially considering his status as the former champion and Lesnar’s dubious history with drug testing. That’s why the Cleveland native wants his rematch with Cormier sooner rather than later. “I want a title shot. I deserve it. [Lesnar] hasn’t fought in how long? For him to get a title shot, as I get thrown to the side? It just seems like they are desperate for pay-per-views,” Miocic said. As for Cormier’s part in all this, he actually issued an apology to Miocic last week for the insanity that unfolded in the Octagon after their fight at UFC 226. That being said, Cormier also added that he doesn’t expect to face Miocic again mostly due to the timing of his fight with Lesnar in early 2019 and his planned retirement in March 2019 as he approaches his 40th birthday.